I make Nomad List and am now learning 3d. I travel to work from anywhere, bootstrap companies. I also made 12 startups in 12 months. Sometimes I speak at events and maybe at yours. Before, I made a YouTube w/ 100+ mln views. Follow me on Twitter or read my posts. You can pre-order my book MAKE now. By modeling it in 3d! Well, I had never done any 3d before. I’ve coded and designed web apps like Nomad List. I’ve produced electronic music. But I’ve never made 3d. The rise of virtual reality is going to change things in the next decade. First we’ll see it in gaming. But quickly after, it will take over all software interfaces. Why have a flat 2d dashboard when we can see our data visualized around us? And think about content. Who needs a New York Times text article telling us about the destruction of Palmyra in Syria, when we can transport ourselves there and experience what happened in immersive 3d?. I am very aware how new paradigms can make your skills irrelevant overnight. So I felt it was time to install my own human firmware upgrade and learn 3d. Where do you start though if you never did any of this? Before doing anything I wanted to think about how I’d approach this. In web development, I don’t do things in the proper way (e.g. I don’t use SASS, Grunt, Gulp, Node.JS, Meteor or React), instead I’m extremely pragmatic. I use a text editor and I write plain code. It’s simple and fast and works for me. I wanted to do the same while making 3d. Another thing was that I learn better from practice, not theory. Doing courses on stuff makes me “know” about how to do things but I won’t learn how to actually do the things. That’s why I wanted to dive straight in with a project like this. It had a specific end goal: “does the 3d scene look like the photo?”, if “no”: go to start, if “yes”: you win! The great thing about 3d vs. web development is that everything fits in one package. There’s no text editor, no minifier, no compiler, no deploy scripts, no unit tests, no server, no back end, no front end. It’s just one big app with a 3d view and endless amounts of internal panes where you can adjust every little detail of an object, light or scene. What about deployment? Your deployment is a render. A .jpg picture or a .mp4 video file. P.S. If you don’t want to see the process, click here to skip to the final part. For a start I went into Photoshop and cut out the basic textures from my photo. This was cheating though but it was only temporary. I literally just dragged the textures as files onto the model in C4D and it put it on there. I then applied my self-made textures and everything suddenly started to look much better. Then there was somebody who suggested tweaking my render settings. I changed my render mode to Physical, which results in more realistic but heavier rendering. Adding lights was another challenge. I literally experimented for ages trying to get it right and it’s still not there. 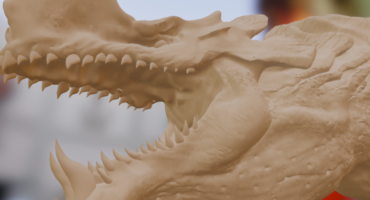 I think this is the hardest part about 3d modeling. Then a random guy from Twitter called @shoinwolfe sent me a video of the street I was modeling, IN REAL LIFE! @levelsio Brb gonna go into the dark depths of northern Tokyo ??? Will send pics tomorrow ?? I watched his video hundreds of times to get an idea of the depth of the scene. Because the photo I had was flat and I had to guess everything. Coincidentally, I was visiting Korea, which is, well, next to Japan! And what better way to get a REAL idea about what I was modeling than, well, actually standing in it? 24 hours later, I land in Tokyo. I meet up with Shoin (the guy from that random Twitter video) and Shane (those names tho). Yes, that’s Gundam (I was told). Shoin takes me to the neighborhood of Itabashi in Oyama-cho. On our way we saw a gun shop that could’ve come just out of a video game. It’s so weird as I’ve seen this scene so much, modeling it for hours on end based on different photos to try and get an idea of how it looks in depth. And now Shoin brought me here and we’re on a side street of it. We go right into a dark little pathway and suddenly, there it is! I’m slightly shaking and shocked. 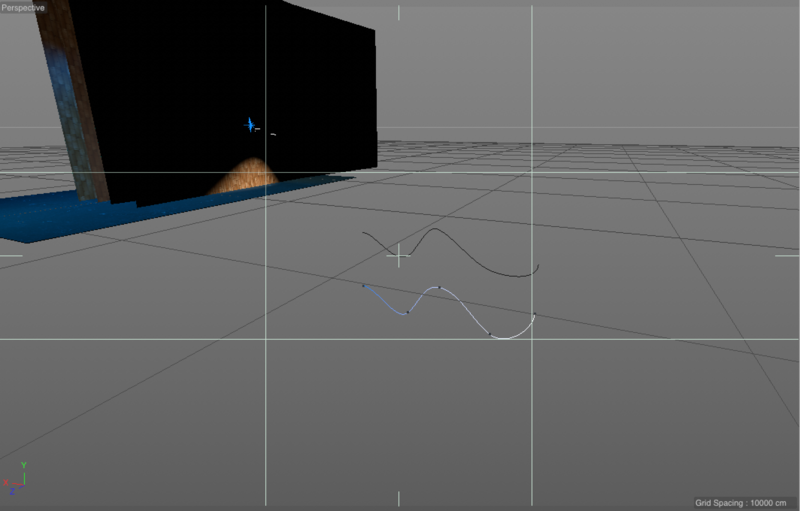 I’ve been in this street for ages, inside Cinema4D. Now I’m actually there. Everything looks much smaller than I thought. It’s tiny! But just as impressive as the photos I saw. There’s endless details everywhere. From small plant pots, to little menu signs, to small random artifacts. It’s really dark and that’s why the lanterns dominate the coloring of the entire scene so much. It’s hard to capture in a photo as it’s so dark, so any photo you make has to be quite a long exposure shot. The main area of interest of this scene is clearly the bar on the left side called Bar 254. It’s a whisky bar (I googled it) and it’s literally considered a “tiny bar”. 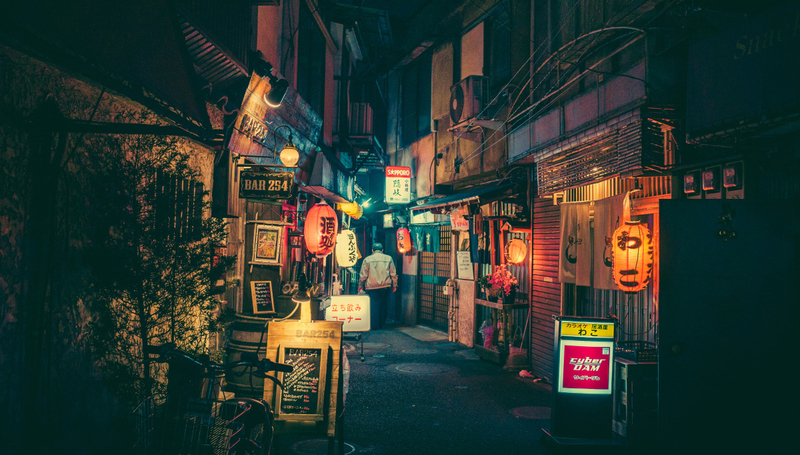 These are small Japanese drinking establishments literally the size of a tiny room or closet. You can just fit in a barkeeper, and maybe 4 or 5 guests. But it’s cosy. And impossible to keep a conversation to yourself. So it usually becomes one big group shouting match inside a tiny bar. Haha. I tell the owner I modeled his bar and street for weeks. He seems impressed but also completely oblivious why anyone would pursue such an endeavor. I show him my 3d scene and he smiles. He still doesn’t understand why though. Haha, I don’t understand why either! Shoin says he feels like we’re kids from a local art college who did a school project, haha. I see why. Some parts are very off, as I had no way of seeing how they looked before being there. There’s definitely tiny details missing that I didn’t have time for or prioritize. I like the last few pics most. This was one of the most fun things I did in ages. It was super refreshing to learn something I was never any good at. Something that was creative, didn’t have a purpose, but just fun. The modeling and decorating the scene was extremely meditative. I know while coding you can get into some deep zones, but tweaking a little 3d object for hours just makes me enter an extra zoned out brain state. It feels great and reminds me of when I used to be in Photoshop for hours as a teenager. Basic 3d isn’t hard. I’d say the biggest challenge is getting the light right. Pretty much the same challenge as with photography. The way of learning this was very useful to me. Instead of reading books or taking courses, I just dove in and tried to make something. And I every little thing I didn’t know, I just Googled. From “how to carve out text cinema4d” (answer: use a Boole) to “how to make an object give off light” (answer: enable illumination on its material). If you want to learn it, I’d recommend trying to make a little scene too. Stick with it. Modeling after a photo works and gives you a very clear end result that you have to come close to. The next step is actually making it possible for people to walk around in my scene inside virtual reality. But on the web. How? Well, there’s Unity 3d. Which is a 3d engine that enables you make your scene interactive. It’s mostly used by game developers (especially like the whole indie game scene), but you can make anything with it, really. Luckily for me, Unity 3d supports the new web standard for 3d called WebGL (and soon WebVR), which means in the end I’ll be able to showcase my 3d scene inside a web browser and VR device easily. That’s great because I can give you a URL to my site and you can put your phone in a Google Cardboard VR viewer or hook it up to Oculus and instantly you’re in my little 3d world. By the way, I’m writing a book called MAKE, which you can pre-order now. And I’m now on Twitter and Instagram too if you’d like to follow more of my adventures.